Fits at least 350 mm performance graphics cards, like the ATI 5970. Unique 2 x Hot-Swap Enabled Front-loading Trays for easy SATA HDD installation and removal. Over clocking and water cooling friendly: The Predator is predrilled for water cooling tube access ( 3 holes on the rear) and supports a dual 120mm radiator at the top panel. Bottom mounted Power Supply with removable filter and anti-vibration supported.. Mounting Holes for external dual radiator at the top. Wire Routing Cables management Cable Compartment enables tidy cable management and unimpeded airflow for stable system operation. The convenient top I/O panel enables easy access to two USB 3.0/2.0 ports, one eSATA port and two audio ports. Black Internal finish for sleek look. 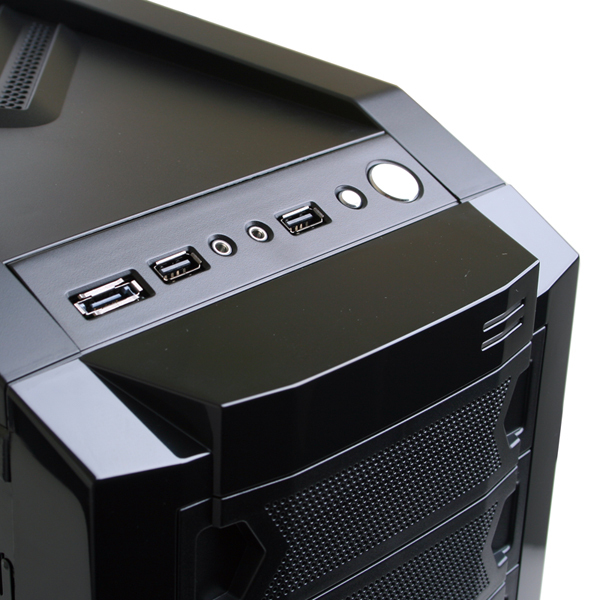 Case Front: First there is the I/O Panel, it has a total of two usb ports(3.0), MIC, audio out, eSATA, Power and Reset switches. Next are the front panel LEDs, one blue LED displaying power status and one red LED displaying HDD status. Moving down the case there are four 5.25 HDD bays followed by the front case fan. The Fan glows a nice blue which goes along with the shade of the power LED. Last but not least is the hotswap bays located on the front of the case just under the fan. The hotswap bays have a door which when pushed in unlatches to reveal two drive bays. The swap tabs when punched allows the bay trays to slide forward and you can pull the drives out of the computer. Simply swap in a drive and close it back up and the drive will load automatically. Case Rear: On the rear we have our other included 120mm fan, if you are building with a liquid cooler this will support the radiator. We also have a total of 7 expansion slots as well as grommets fitted to the case for watercooling tubes. Lastly in this case the power supply mounts at the bottom of the rear. Case Top: The top has an arrow design and holes to allow air to flow through. Below this panel the case is able to house two 120mm or 140mm fans. You will be able to fit a push-pull configuration 120mm heat sink in anyway you wish and still have two 120mm or two 140mm fans. Case Bottom: Looking at the bottom we have four rubberized feet. Also here is a fan filter should you choose to mount your PSU fan side down which is a nice feature to have to keep dust from your PSU. Left Side Panel: The left side panel has the same design as the right side however it of course doesn't support fans nor does it have holes in it. The panel may be removed for quick access to cable management and other features. Right Side Panel: Notable here is its ability to sport two 120mm fans or one 200mm fan via a large perforated grill providing excellent airflow. Inside Case: Inside the left side panel you will notice the amount of holes leading to the back which makes for easy wire management and this case has one of the best management systems I have seen. Also looking at the motherboard tray the biggest hole of all is very important because it allows you to swap out heat sinks or water blocks without the need to remove the motherboard from the case. If you hadn't noticed already then note that the entire inside of this case is painted black. Inside the right side the first thing you'll notice is the room available for the expansion cards. Boasting approximately 13.75" this case definitely has room for any current cards and any potential new ones should they continue to get longer. 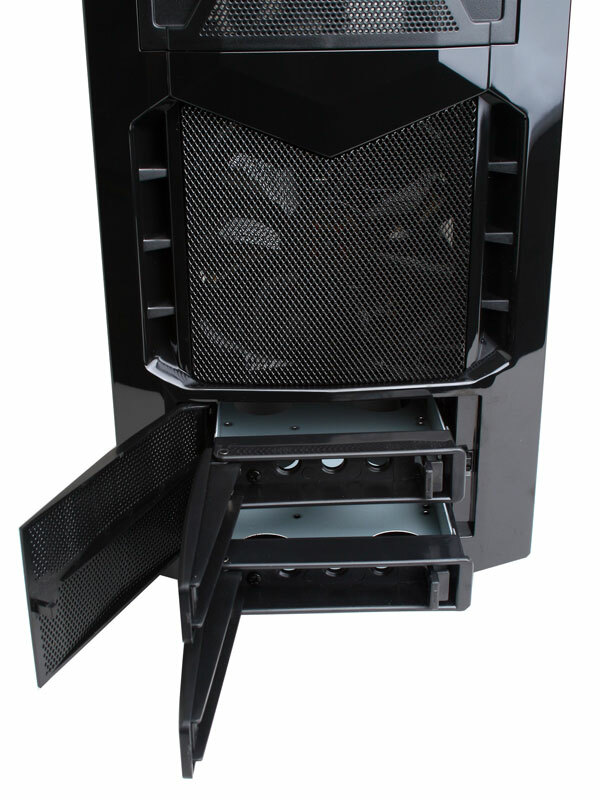 The AXP970 is capable of having up to two 120mm side panel fans or one 200mm. It also allows for two 120mm fans to mount under the top panel which is also able to accomodate a radiator. This case has a lot of potential being able to mount four additional fans if all are 120mm or three if you choose 140mm for a side fan. Another great feature is the tool-less solution for 5.25" devices with screw in knobs capable of moving forward and backwards to line up with the holes in the components. Those of you moving onto Solid State Drives will appreciate the hidden side mounted bays able to mount up to four 2.5" devices. Next we have two 3.5" bays for hard drives. There is one other 3.5" bay not pictured which is just below the hot swap drive bay at the very bottom of the case. The I/O board panel for the hotswap drive bays mounts nicely in the front with the other drive bays using virtually no extra space. This board is powered by a single molex connection and allows two drives and two fans to be able to run off the panel. Once the SATA data cable is plugged in from here to the motherboard and provided you give the distribution board power with its molex connection, you are then able to swap drive in and out of the bay just behind it. 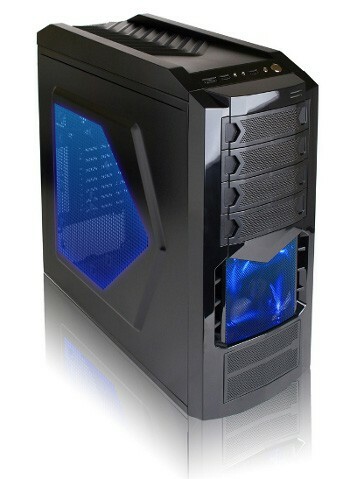 This case has the room to keep cool and be expandable while staying affordable and stylish. Excellent wire management with the large number of provided holes as well as nice amount of space between the left side panel and motherboard tray. The expandability leaves a lot of options for future add ons. It's great to see case manufacturers trying to make it easier and quicker to install and remove hardware using tool-less solutions. Price is also important to consider when buying any case and when it comes to getting more for your money you definitely aren't getting ripped off here. This case fetches a very nice and modest $79.99 on Newegg which I must say is very impressive considering how much is really offered with this case. If you happen to be looking for a case and want my recommendation then yes I say this case has got to be the best bang for your buck.